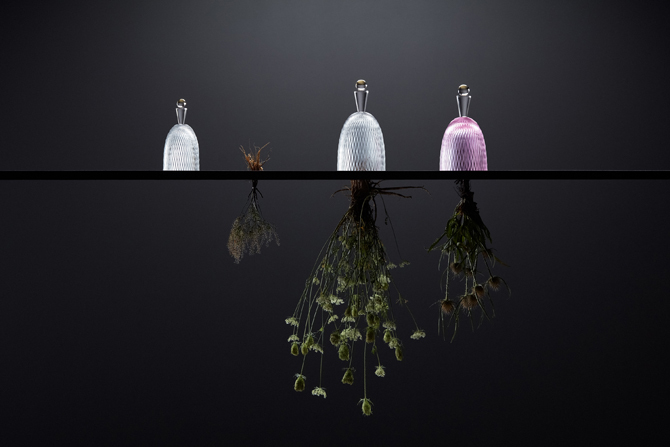 Award-winning Czech photography studio BoysPlayNice present stunning glass design created by Rony Plesl for Czech glassworks Rückl through a bespoke exhibition combining photography and glass objects. The Rückl family glassworks is renowned for top-quality cut crystal since 1846. They recently received the Czech Grand Design Award for their new collection created under the artistic directorship of Rony Plesl, himself one of the most acclaimed Czech product designers, known mainly in the field of glass design and for his original glass and stone sculptures. The photographs of BoysPlayNice follow this new chapter of the recent Rückl glasswork renaissance. Their still life photography highlights the simple elegance of glass craftsmanship, the perfection of the grinding, and the carefully considered detail. Glass objects are combined with products of nature found in the Northern Bohemia where most Czech glassworks reside. BoysPlayNice not only create beautiful design photographs, but they are also story-tellers, offering us a subtle meditations on the materiality of glass and its cultural context of tradition, myths, and identity.